Go ahead and pay for that guac, Chipotle, you deserve it. 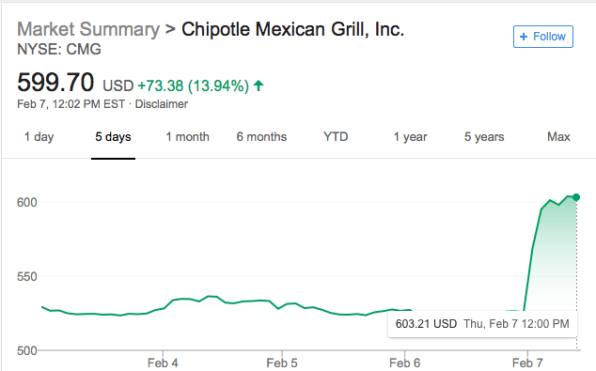 After a rough few years marred by a series of food-borne-illness scares, including a high-profile E. coli outbreak, shares of Chipotle Mexican Grill Inc. have climbed to their highest in more than three years. The food safety issues had sent the stock spiraling like old salsa down the drain, erasing billions in shareholder value and damaging the brand. But Chipotle, it seems, is on an upswing. According to Bloomberg, the chain “handily beat” earnings, sales, and margin expectations. The recovery of everyone’s favorite better-for-the-world fast food chain is thanks to a multi-faceted approach led by the company’s new CEO, Brian Niccol. 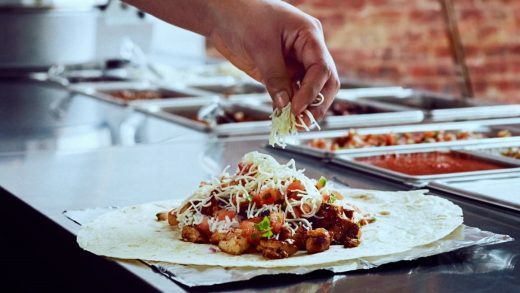 Chipotle boosted its business through easy mobile ordering, expanded delivery, improved digital capabilities, and a new loyalty program that managed to bring customers back in the door. In the past 12 months, Chipotle shares have climbed 117%, Bloomberg reports. That is surely enough to merit some guac, even though it’s extra.